Students at Dennis Intermediate School will return to school for the first time Monday since a shooting at the school in December left a teenage suspect dead. RICHMOND, Ind. 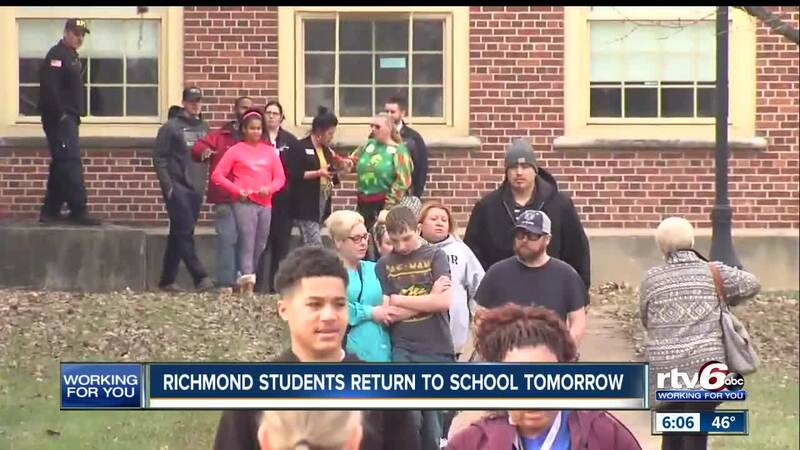 — Students at Dennis Intermediate School will return to school for the first time Monday since a shooting at the school in December left a teenage suspect dead. Students and staff gathered at the Tiernan Center before winter break to celebrate already scheduled end of the semester activities, according to a tweet from the school district. When students and staffed arrived at the center, therapy dogs and cards were there to greet them. On Dec. 13, a 14-year-old died after shooting the glass of a door and at officers. No students, staff or officers were injured. Also starting on Monday, all Richmond Community Schools will use the Raptor Visitor Management System. This will require all visitors to present a state-issued license.